without a large compensating relaxation in monetary policy, then you will get the stagnation in output that I showed at the top of this post, and a substantial increase in unemployment. Can this scale of fiscal contraction in itself fully account for the second Eurozone recession? There are various ways of answering this question: see, for example, this work by Jordà and Taylor, or the analysis by Holland and Portes that uses a structural econometric model. A very recent paper (available here) by Ansgar Rannenberg, Christian Schoder and Jan Strasky does something different. It uses modified versions of three different DSGE models to analyse the impact of the Eurozone fiscal contraction from 2011 to 2013. One of these models is QUEST III at the European Commission, which Jan in‘t Veld used in analysis I described here. The other two are FiMod, developed by staff of the Deutsche Bundesbank and the Banco de Espana, and NAWM, the ECB’s New Area Wide Model. All very ‘anglo-saxon’! The idea that a large fiscal contraction shortly after a huge financial crisis would lead to a second recession is not the wild imagining of a group of ‘anglo-saxon’ economists, or a particular macroeconomic ‘school of thought’. It is just mainstream macroeconomics. And we must never forget that this is not the unfortunate cost of having to get debt down in a few periphery countries: as the chart above shows, this fiscal contraction occurred everywhere in the Eurozone. As the simulations described in this link (pdf) show, using the Belgian NIME model, these costs could have been largely avoided if the fiscal consolidation had been delayed until monetary policy was in a position to offset them. It is not just a predictable recession; it is a recession made by policymakers without good cause and therefore an entirely avoidable recession. What was the most important point about Ed Miliband’s speech to the last Labour party conference before the election? The UK media had no doubt. It was that he forgot to mention the deficit. No matter that Ed Balls had spent much of his previous day’s speech laying out their policy on the deficit, which has been intelligently discussed by the IFS and others. Miliband had in his speech forgotten the paragraph where he says how important the deficit is, and he was going to be taken to the cleaners for it. I’m not just talking about the right wing press here. Channel 4 news likes to think of itself as being a little more highbrow than other news programmes, and I’ve no doubt that conservatives would describe it as left wing. So here is a link to John Snow’s interview with Miliband yesterday (skip intro and question on middle east to about 3 minutes in). He asks Miliband what the greatest issue facing the next British government is. Miliband responds that it is getting the country to work for most working people rather than be stuck with a more unequal country. Interesting answer, but inequality is not an issue mediamacro recognises. It was a trick question. Now that is twice that you have forgotten to mention the deficit, responds Snow. How could you not mention paying off this appalling deficit? Snow continues. Surely it is the most important issue of all. It is the essence of our economic crisis. And so on. Now my point here is not about bias, and how this interview could have been scripted by George Osborne. It is about the banality of it all. If you are going to talk about the deficit, ask some real questions about the differences between Labour and Conservative plans. Ask why Labour thinks that debt should not come down more rapidly. There are lots of meaningful questions you could ask. But trying to make a great issue out of a forgotten part of a speech is just silly. It is gotcha journalism for those who get their economics from listening to political commentators. The implication that the deficit is all important, and linking it in a causal way to the recession, is mediamacro at its worst. What is the really important thing that has happened in the UK economy over the last six years? It is not that the deficit went up and then has started coming down. It is that UK productivity has stalled, and as a result real wages are lower than when the recession began. That is what really matters. That is not a ‘political judgement’; it is what most economists and most ‘ordinary people’ will tell you. But not in mediamacro land. So when Cameron gives his speech to the Conservative party conference, and does not mention this terrible productivity performance, I doubt if one single journalist will even bother to ask why that was not in his speech. This is journalism at its most pathetic. In my view, the answer is in the 1970/80s with the New Classical revolution (NCR). However I also think the new ideas that came with that revolution were progressive. I have defended rational expectations, I think intertemporal theory is the right place to start in thinking about consumption, and exploring the implications of time inconsistency is very important to macro policy, as well as many other areas of economics. I also think, along with nearly all macroeconomists, that the microfoundations approach to macro (DSGE models) is a progressive research strategy. That is why discussion about these issues can become so confused. New Classical economics made academic macroeconomics take a number of big steps forward, but a couple of big steps backward at the same time. The clue to the backward steps comes from the name NCR. The research programme was anti-Keynesian (hence New Classical), and it did not want microfounded macro to be an alternative to the then dominant existing methodology, it wanted to replace it (hence revolution). Because the revolution succeeded (although the victory over Keynesian ideas was temporary), generations of students were taught that Keynesian economics was out of date. They were not taught about the pros and cons of the old and new methodologies, but were taught that the old methodology was simply wrong. And that teaching was/is a problem because it itself is wrong. There had always been opposition to Keynesian ideas, and much (though not all) was ideological, such as attempts to remove Keynesian textbooks from US universities. However the NCR gave what should more precisely be called ‘aggregate demand denial’ an intellectual respectability that it never deserved. The reasons for believing that shifts in demand move output and employment in the short run and prices are sticky are overwhelming, so to deny both was a seemingly impossible task. It was achieved by adopting a methodological position which could ignore inconvenient evidence. I do not think it had to be like this. Mainstream macroeconomics did not need a revolution in the 1970s and 1980s. Ideas like rational expectations could have been assimilated into the mainstream methodology, and microfounded models could have been developed alongside more eclectic econometric models (SEMs, not VARs), or aggregate theoretical models that Blanchard and Fischer rightly called ‘useful models’. Microfounded models could have shown the kind of errors that can arise in more empirically based models when theory is ignored or only applied piecemeal, and these empirical models could have highlighted the key areas where additional microfoundations were needed. I think if this had happened, macroeconomics would have been better prepared when the financial crisis hit. Take just one issue: the role of credit conditions in influencing consumption. This is clearly crucial in understanding how consumption might respond to a credit crunch, yet any mechanism of this kind was absent from most DSGE models in 2008. However a more empirically based model of consumption would have had to address this issue well before 2008, as I argue here. If these types of models had continued to be developed within academia, rather than confined to the dustbin by the microfoundations revolution, then at least policymakers would have had something to work with. If there had been interaction between empirical and microfounded models some of the financial frictions literature that has flourished since 2008 might have appeared earlier. So why didn’t this happen? Why did we have a revolution which overturned an existing methodology and temporarily banished Keynesian theory, rather than an adaptation and augmentation of what was then mainstream? Was the attraction of overturning orthodoxy too strong, as it is for a minority of heterodox economists today? Did an ideological imperative of dismissing Keynesian ideas play a role? To what extent was the hostile reaction of many in the macroeconomic establishment to eminently sensible ideas like rational expectations responsible? Was the attraction of a methodology where at least you could be sure you were consistent too enticing, perhaps encouraged by increasing segmentation between theoretical and empirical macro? I would love to know the answer to these questions. Both the IFS and the Resolution Foundation crunch the numbers, and come up with a broadly similar assessment of the different UK political parties fiscal plans post 2015 to the one Giles Wilkes, Steven Toft and I independently arrived at a few months ago. Essentially if for some reason (?) you want to bring debt down quickly and are not worried about a further dose of austerity and possibly repeating the mistake of 2010, vote Conservative. Are Labour and the LibDems shouting about this really important difference as a way to gain votes? Exactly the opposite is true - they want voters to think that they are as ‘tough’ as the Conservatives on the deficit, but just a little more compassionate in the way they will reduce it. We are in the world of ‘mediamacro’, where ‘responsibility’ is code for fiscal austerity (which, in the real world of the liquidity trap, is of course irresponsible), and ‘credibility’ is code for the policies that business ‘leaders’ and the financial ‘priesthood’ like. As I noted here, this is one of the things this government got right, and it would be a shame (and dangerous) to take a step backwards. So the IFS is correct, but the argument appears strange at first, so it may be worth spelling out. Having a deficit target to be achieved within the next five years, where that five year period remains as time moves on (a rolling target) seems far too easy. There is never a date by which we can unambiguously say that the target has been achieved or not. It would seem much better to have a target for a fixed date e.g. current balance by 2020. The problem with this logic comes when we approach 2020, and some unexpected shock occurs. Rather than adjusting to that shock gradually over the next five years, adjustment has to be very rapid. This breaks the first rule of fiscal management, which is that the deficit should be a shock absorber, not a rigid target. In fact we are used to a similar idea from monetary policy. This attempts to achieve the inflation target within the next two years or so. (In the UK this two years used to be set in stone, but less so now.) The reason often given for this is that it takes some time for changes in interest rates to have their full influence on prices, but this is only part of the story. Interest rates have some impact on prices quite quickly, so it would in principle be possible to try and meet an inflation target with a shorter time horizon, but the reason this is not attempted is that it would lead to damaging variability in interest rates and output. The inflation target that most central banks have is also a rolling target: no central bank says it will aim to achieve its target by 2016. This does not stop central banks being accountable for their actions. If inflation is not on target by 2016, and there were no unexpected shocks over the previous two years, the central bank will come in for plenty of criticism. However if oil prices unexpectedly rose substantially in 2015, we would not want or expect the bank to do everything in its power to keep to its inflation target in 2016. The same logic applies to fiscal policy. It is true that rolling targets do give the fiscal authority the possibility to cheat, and as Jonathan Portes and I argue (here or here), if the government has in the past always cheated and there is no institutional arrangement to stop this happening, then fixed date targets may be an unfortunate necessity. However we also argue this is not the case in the UK for two reasons. First, in the past UK governments have proved to be quite capable of taking the actions required to meet fiscal rules - what has often derailed them has been unexpected shocks like recessions. Second in the OBR we have an effective fiscal council which in this respect acts as a watchdog. So let us hope that the fact that current plans are expressed as fixed date targets reflect the desire for easy communication just before an election, and that whoever gets elected reverts back to rolling targets when in government. Let us hope that achieving fiscal targets by 2020 does not become part of what mediamacro thinks is responsible and credible. When this happens (taken from a post by Jérémie Cohen-Setton), something has gone very wrong. 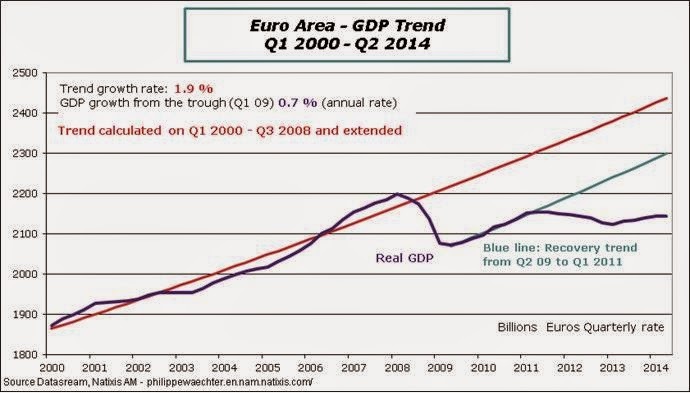 The Euro was meant to increase growth, not create stagnation. So what, or who, is to blame? Many outside the Eurozone, and a growing minority within it, will say the Euro itself. But that is not a very helpful response. Given the level of commitment to the Euro, it is the only correct response if there is no version of this currency union that can be made to work better. Others will say that the only way forward is further political integration through a fiscal union. That seems like the political equivalent of going from the frying pan into the fire. The story of the Euro is as much a political failure as an economic failure. But I also suspect support among many economists for fiscal union is built upon a questionable premise. The premise is that the current difficulties arise because it is inevitable that Germany will put its national interest above the interests of the Eurozone as a whole. This argument goes as follows. As a result of undercutting other union members, Germany has become too competitive within the Eurozone. This will be reversed. The ECB has an inflation target of almost 2%. Therefore in normal circumstances we would see inflation above 2% in Germany for some period. This is unfortunate for Germany, but those are the macroeconomic rules of the game in a monetary union. It is natural for economists to reason this way, because we are used to thinking about rational self-interested individuals. But suppose the problem with German public opinion is not that it is being narrowly self-interested, but that it has been encouraged to think about this in the wrong way. There are two aspects to this. First, although Keynesian economics is taught in all universities, in appears taboo in much German public discussion. Under this anti-Keynesian view the chart above has nothing to do with fiscal contraction, so it must be all about the lack of ‘structural reform’ outside Germany. Second, German politicians are in denial about the implications of low German inflation before the crisis. Logically the only way Germany can avoid above 2% inflation is if the Eurozone as a whole goes through a prolonged depression, but as is painfully obvious from the comments on some of my recent posts, the German public is not told about this. The two deceptions help reinforce each other. Germany says it is doing OK without the need for fiscal stimulus, so why do other countries need it? Of course Germany is doing fine because its period of relatively low inflation allowed it to uncut its Eurozone competitors. Never underestimate the power of bad ideas, particularly if they have ideological roots. Here we have the two mistakes that led to the Great Depression being repeated. We look back at the 1930s and think if only they had known about Keynesian economics a depression could have been avoided. However the depression was as much about countries attempting to stick with the gold standard, and the problems with that were obvious at the time. Today we do know about Keynesian economics, but both mistakes continue. It is possible to believe that balanced-budget fundamentalism is somehow hard wired into the German psyche, and I have personally experienced moments like that described in this comment to my earlier post that seem to confirm this. So I do not want to discount such explanations entirely, but I do wonder if a powerful motive behind this is just the same anti-state neoliberalism that you see elsewhere. Those on the right appear to have a greater distrust of economists and their theories. This may be true of popular attitudes (HT Tyler Cowen), but it is also the case of those running the country. According to Der Spiegel, the three permanent secretaries running the German finance ministry have studied law rather than economics. Among the nine department heads seven are lawyers and just two are economists. While the balance between lawyers and economists has always favoured lawyers, it has apparently become worse under Schäuble (whose doctorate is also in law). As a result of all this, it is not at all clear to me that the current problems of the Eurozone are all down to German self-interest. The case for additional infrastructure spending in Germany looks strong, as argued by Marcel Fratzscher, head of the German Institute for Economic Research (DIW). It would therefore seem more than possible to get Germany to take part in a Eurozone wide programme of additional public investment, which can be justified on a microeconomic/supply side basis as well as on macroeconomic/demand side grounds. All that stands in the way is the power of bad ideas, and its embodiment in the Eurozone’s fiscal rules. That referendum was fun. Shall we do it again? Whether the UK as a whole gets to choose whether to have a referendum on continuing membership of the European Union depends on the result of the general election in 2015. Given that we have this choice, it is worth thinking about similarities and differences between the EU referendum and the referendum on Scottish independence. The key similarity is that the immediate economic consequences of independence in both cases are negative: according to John Van Reenen, even more so with the UK leaving the EU. In both cases nationalism will play an important role. I would argue that in both cases independence is seen by many as a means to a particular end. With Scotland, it was a way of ensuring that Scotland would not be governed by a right wing Conservative party. With the EU, it is a way of stopping large scale migration into the UK. Is another similarity that the established parties are likely to be united in arguing against independence? There must be serious doubt about this. I suspect that Cameron has a strong preference for continued membership, and even that in his eyes the referendum is largely a political ploy to stop Conservative voters moving to UKIP in 2015. However Cameron also has a preference for remaining the leader of his party. He is very unlikely to get significant changes to the terms of EU membership before the referendum, including the free movement of labour. There are said to be between 50 and 100 Conservative MPs who will argue for leaving the EU whatever the outcome of Cameron’s negotiations. There are about 300 Conservative MPs at present. It is therefore possible that, once the negotiations have ended with little gained, a majority of Tory MPs will want to exit from the EU. This leads to one clear difference between the two referendums. I think it is fair to say that outside Scotland few took the chances of a Yes vote seriously until the final weeks of the campaign. There are three reasons for thinking that will not happen with the EU referendum. 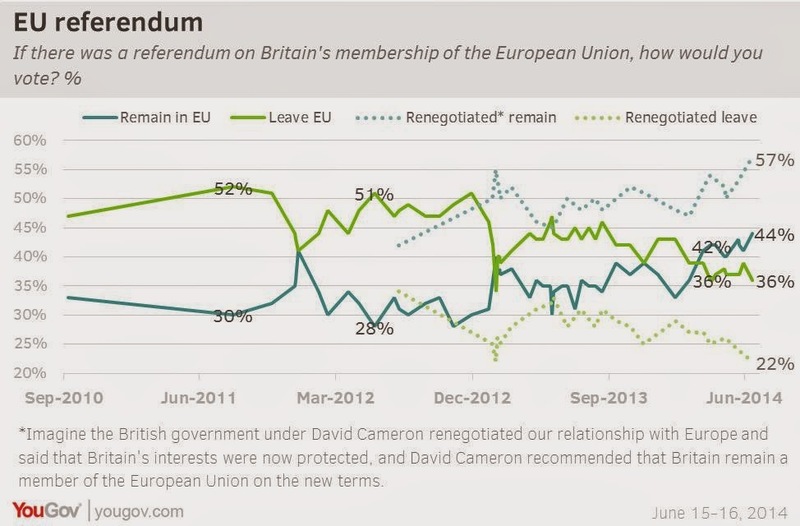 First, UK public opinion has until quite recently shown a majority in favour of leaving the EU. Here are the polls conducted by YouGov. Second, unlike Scottish independence, a majority of the UK press will be arguing for exit from the EU. Third, to make his negotiating stance credible, Cameron will have to at least give the impression that he might decide to recommend leaving the EU if he does not get significant concessions. As I note above, he will not have to try very hard. This has an important implication which I think has been underestimated by many. Once the election result is known in 2015, if the Conservatives win there is a distinct possibility that the UK may vote to leave the EU. That kind of uncertainty is likely to be bad for non-residential investment, during a period in which we might hope that investment demand takes over from consumption as a primary driver of growth. We also know that, if the Conservatives win the next election, there will be a renewed fiscal contraction. With interest rates likely to be close to their lower bound, there remains limited scope for monetary stimulus to counter these influences. So this is one important difference between the two referendums. Because most people were assuming a No vote until the last few weeks of the Scottish campaign, it seems unlikely there was sufficient uncertainty for a long enough period to have damaged the Scottish economy, and as far as I know there is no evidence that it did. In contrast, the two years of uncertainty from 2015 and 2017 is almost bound to be damaging for the UK economy. Economics is often called the dismal science, and the Scottish referendum showed why this description has stuck. The Yes side appeared full of hope and optimism about what could happen once the constraints of Westminster rule had been cast off, while the No campaign kept on going on about one problem or other, which usually involved economics. This is of course not new. Politicians on the right like to believe that tax cuts will pay for themselves, and it is boring economists who (mostly) point out this is not true. Politicians of all shades thought that austerity would not have much impact on output and growth, while the vast majority of economists knew better. One of the reasons for deficit bias is that politicians believe that their policies will galvanize the economy and raise the tax base, and most of the time the macroeconomy stubbornly refuses to be impressed. Now it is tempting to say, given this evidence, that politicians will believe anything that suits them. 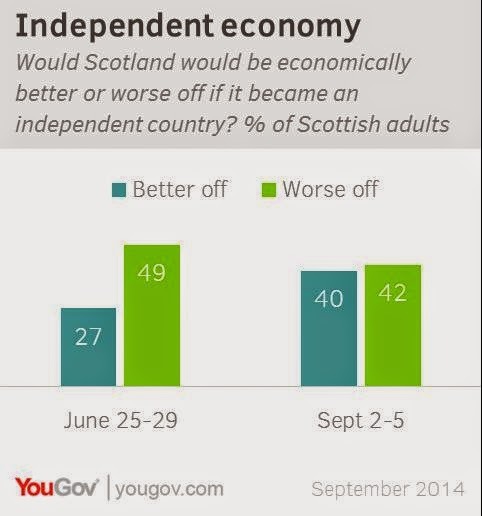 But what the independence referendum showed us is that voters have similar problems. As the campaign progressed the stronger the Yes vote became, and there is some evidence that this reflected additional information they received. As I suggested here, the problem is that this information was superficially credible sounding stuff from either side, but often with no indication from those who might have known better of the quality of the analysis. For me this has always been the major argument for establishing fiscal councils - independent institutions who are charged with, at a minimum, scrutinising fiscal projections. Although the OBR (the UK’s fiscal council) has a remit that is quite narrow, we also have the highly respected IFS. In Sweden the fiscal council itself has a much wider economic remit. Whenever I make this point, someone puts forward the argument that this is anti-democratic, or that I want economists to dictate decisions. This is wrong on at least two levels. First, my general argument is not specific to economics, but involves any area that involves technical expertise. Indeed, the case I make here is partly to avoid politicians using the views of a small minority of economists as cover. Second, the problem with democratic accountability as normally defined is that it is very weak: voters make one decision every five years that involves a whole basket of issues. I would suggest that charging an institution with a small set of tasks, where there is effective democratic oversight over the performance of that institution, can make that institution more accountable to the electorate than any politician doing the same. In the case of Scottish independence, although we did not have a direct assessment of fiscal prospects from the OBR, that organisation’s oil revenue forecasts were used by the equally respected and independent IFS to point out the problematic outlook that an independent Scotland would face. Although the Yes side attempted to suggest that the OBR was part of the very Westminster elite that it wanted a divorce from, I suspect many voters saw this as independent analysis and were concerned by it. In a world where politicians can always find some experts to back their view, I suspect it is only through singular institutions like the OBR and IFS that the views of the majority of economists get to have some influence, and the economics of wishful thinking gets exposed. This book, by Peter Temin and David Vines, has just been published. As you can see from the endorsements, I liked the book. In this post I just want to focus on a particular chapter, which was Keynes’s role as part of the Macmillan committee, an episode I did not know about before. Just as the book does so well, I want to draw parallels between the past and current events. It is the end of 1929: UK unemployment was already high as a result of going back on to the gold standard five years earlier, and Wall Street had just crashed. The new Labour government was overwhelmed, so in the British tradition it set up a committee to recommend what to do, and Keynes was a member. 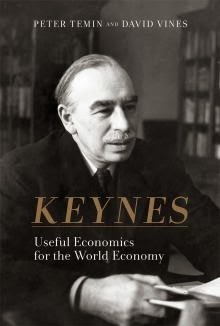 As Temin and Vines note, although Keynes was at the centre of economic discussion at the time, he was also outside the establishment, as a result of publishing his attack on the Versailles treaty in the Economic Consequences of the Peace. Keynes diagnosis of why British unemployment was so high linked returning to the gold standard at an uncompetitive level and the problems of downward nominal wage adjustment. The book’s description of how the then governor of the Bank of England, Montagu Norman, failed to see the problem is amusing - from a distance of nearly a century - but of course as the book points out this is exactly the ‘conversation’ that Germany is currently having with the rest of the Eurozone. The obvious solution was therefore devaluation, and the book seems a little ambivalent about whether that was not much discussed because it was ‘off the table’ for political reasons, or whether Keynes and others thought that, having joined (which Keynes had opposed), Britain should stay the course. (Eurozone parallels again. Ironically Britain did devalue three months after the report was published, although as I note here, this was forced rather than a choice.) What Keynes argued for was instead increased government spending, but he failed to convince the committee that its impact on unemployment would not be crowded out. Here Temin and Vines attribute this failure not to the ability of the others to see the obvious, but to the fact that Keynes arguments did not fit with the model he was using, which was the model of the Treatise. They write: “the Macmillan Committee is of interest to us because Keynes’ presentations to it didn’t add up to a coherent view. Rather, they show Keynes thinking on his feet at a time when his ideas were in flux.” Those ideas ended up, of course, with the General Theory. Finally, one thought of my own. When I was younger, I drew the wrong inference about the Great Depression. If only the General Theory had been written 10 years earlier, I reasoned, much of the agony of the Great Depression could have been avoided. Instead I should have focused on the gold standard. Not because this was more important as a cause of the world wide Great Depression - it well might have been - but because of what it tells you about the influences on macroeconomic policy. Montagu Norman said to the committee “I have never been able to see myself why for the last few years it should have been impossible for industry, starting from within, to have readjusted its own position”. This was a few years after the General Strike of 1926! This was not someone lacking a coherent theory, but someone blind to the evidence and human nature, and enthralled to the ideology of the gold standard. No doubt being a central banker rather than a worker, or even an industrialist, helped this blindness. The lesson I should have drawn from the Great Depression is that a powerful ideology, in the hands of people remote from those adversely affected by it, can overcome common sense and evidence. This is a follow up to my post on shrinking the state, but actually it is about something I found when thinking about the Scottish independence referendum, so let me start there. If Scotland votes for independence, it will be because enough Labour voters voted Yes despite Labour’s support for the Union. It seems quite clear from the Scottish Nationalists’ pitch in these closing weeks that the appeal to these voters is that by voting for independence you can ensure you never again have a Conservative government. Yet there is a puzzle here. 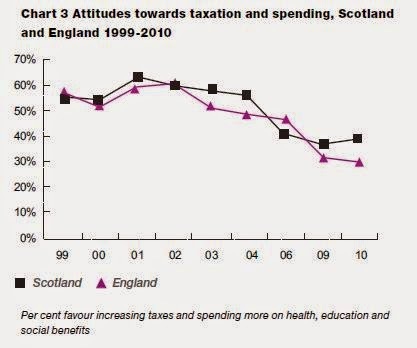 England and Scotland are not so different in terms of political attitudes. This is true across a wide range of issues: Scots are only a little more to the left than the English. Furthermore, as John Curtice and Rachel Ormston show here, this difference has not noticeably increased over the last ten years. Let’s focus on the specific issue of the size of the state. Here is the proportion of people who thought taxes should rise to increase spending on health, education and social benefits in each country. The proportion is generally higher in Scotland, but not by much, and it has been falling in both countries over the last ten years. When I saw this data, I wondered about what was missing from the chart. Respondents were given two alternative responses: the level of taxation should be less, or it should stay about the same. Here is the same question for the UK as a whole (source: British Social Attitudes survey). The interesting result is how few people want lower taxes - always below 10%. The changes involve shifts between more spending and taxes to no change, rather than to lower spending and taxes. 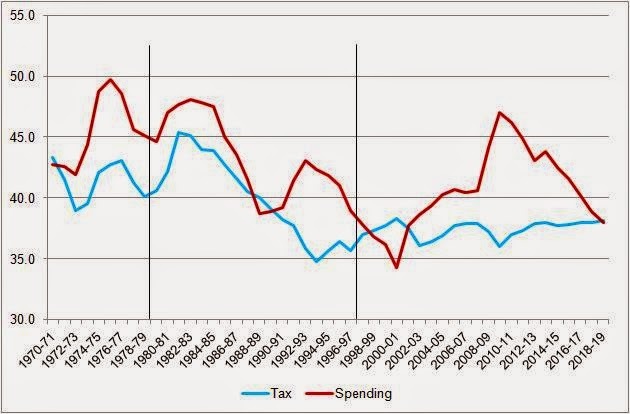 In terms of movements over time, it is interesting to compare this with data on the levels of UK government spending and taxes, over a longer period than I gave in my previous post. If you think about the turn of the millennium as being the end of the Thatcher era, then the Thatcher years saw a reduction in the size of the state, whether measured in terms of taxes or spending. From the previous chart, it looks like this was against popular opinion at the time, because we saw a sustained rise in the proportion of people wanting a larger state in the 1980s. This proportion started falling over the same period that Labour were increasing the level of public spending, which again makes sense. So there is little evidence of a change in public attitudes here: the state was too small in the 1980s and 1990s, and it began to move towards a level the majority desired during the last Labour government. There is absolutely no public mandate for any renewed shrinking of the state. Which prompted this thought. As public attitudes either side of the border are not so very different, and given these particular attitudes about the size of the state, perhaps the relevant question is not why the Conservatives and UKIP are so weak in Scotland, but why are they so strong in England? As John Ruddy notes here, in the mid 1950s the Conservatives won over 50% of the Scottish vote. What happened since then was not a collapse at the expense of Labour, but at the expense of the SNP and Liberals. Perhaps a better way to start thinking about what has been happening is as follows. The big change over time has not involved public attitudes, but the political position on economic issues of the Conservative Party. Just like the Republicans in the US, it has moved substantially to the right, beginning with Thatcher, and continuing under Cameron. Just as with the Tea Party in the US, there is a sizeable minority that wants to go further. However this rightward shift does not reflect majority opinion, and so when enough alternatives exist - as in Scotland - votes have drifted away from the Conservatives to more moderate centre right parties. In a two party system like the US, or with a voting system that favours the two main incumbent parties like the UK, that cannot happen. Prime Minister of UK (including Scotland until 2014) from 2010 to 2017. Widely seen as the catalyst behind the renewed decline of the UK, after a brief respite in the 30 years previously (see entries for Margaret Thatcher and Gordon Brown). On becoming Prime Minister in 2010, embarked on a fiscal austerity programme which delayed a recovery from the Great Recession until 2013, accelerated the privatisation of public services and encouraged social hostility to immigration and the poor. This proved to be a decisive factor in Scotland narrowly voting Yes to independence in 2014. (The other was his decision not to allow a third option for greater devolution.) His administration was then bogged down in negotiations with Scotland for the next two years, which caused increasing bitterness between the two countries. In the UK election of 2015 the SNP captured many Scottish Labour seats, but refused to form a coalition government with Labour, allowing Cameron to continue to lead a minority government with tacit support from the LibDems and (initially) UKIP. Most analysts naturally point to his promise of a referendum on EU membership as his biggest mistake. In the short term this meant that UKIP’s success in the 2015 election was as much at the expense of Labour as his own party. But his decision to recommend voting Yes to continued membership in the EU referendum in 2017 led to an attempt to unseat him as leader which narrowly failed (see entry on Boris Johnson), and then large scale defections of MPs from his party to UKIP. Campaigning under the slogan ‘If Scotland can do it, so can we’, and with the support of large sections of the press, UKIP leader Nigel Farage achieved a very narrow majority to leave the EU, forcing Cameron to resign. Some argue that the Scottish independence decision was critical here, as he would have won the referendum vote if Scotland had stayed part of the UK. A few argue that the decision to break up the BBC and allow partisan broadcasting, and in particular the rebranding of ITV into FOX-UK, was a more important factor in losing the EU vote. There is some dispute as to how much Cameron himself is to blame for these events, or how much was the work of his Chancellor (and his successor as Prime Minister) George Osborne. 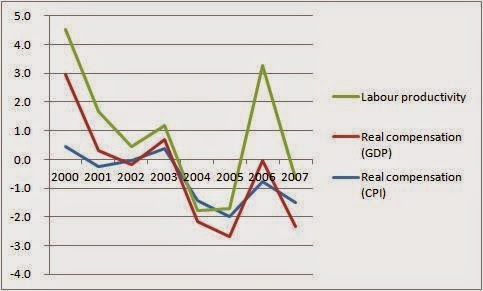 There also remains some controversy over whether the inability of the economy to make up the ground it lost during the recession was due to the initial austerity plan, renewed austerity after 2015, controls on immigration or the uncertainty created by the referendum itself and subsequent EU exit. It is a great irony that the only leader of this period whose current reputation is lower than Cameron’s is his opponent in the Scottish independence debate Alex Salmond, now widely known in Scotland as the Great Deceiver. Scotland’s own economic decline following independence was far greater, following a collapse in oil prices and the loss in UK markets when Scotland joined the EU. 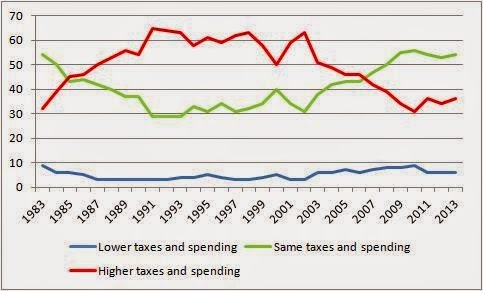 This shows total government receipts (taxes) and expenditure (spending) as a percent of GDP. The two lines meet at the start and end. In 2007/8 we had a budget deficit of 2.6% of GDP. At the time that seemed a bit on the high side: something between 1.5% and 2% would have kept the debt to GDP ratio constant. (Budget balance implies a falling debt to GDP ratio.) For this post the point to note was that the Labour government chose to use this fiscal loosening to increase spending rather than cut taxes. The Conservative government plans to do the reverse. So does that mean that it is just trying to undo the increase that occurred under Labour? The answer is no, and this is where the OBR’s latest report comes into its own. 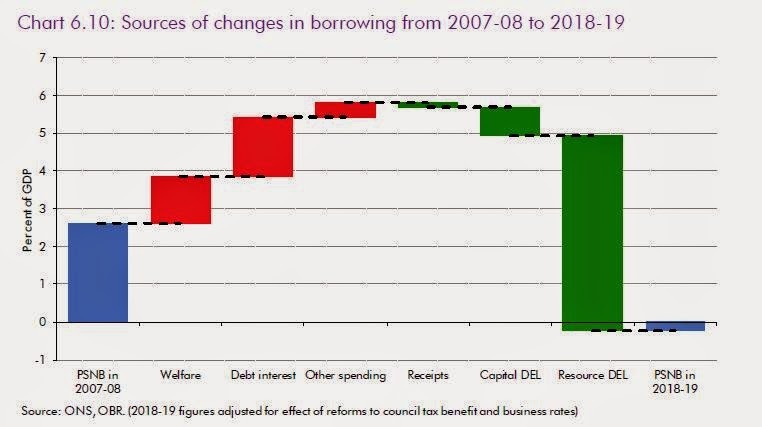 Their chart shows how we get from the deficit of 2007/8 to the small surplus of 2018/9. (There is, as I note here, no good macroeconomic reason to aim for a surplus.) 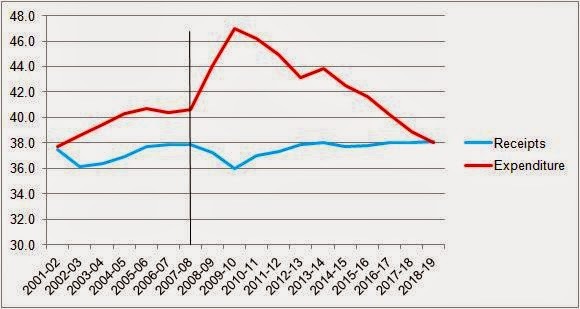 The cuts in spending are not just the size of the 2007/8 deficit - they are much larger for two main reasons: higher debt interest and higher ‘welfare’ spending. The reason for the higher debt interest is straightforward: debt is much higher because of the recession (and to a small extent the fiscal stimulus in 2009). Although academics often assume that higher debt interest is paid for by raising taxes, a more ‘neutral’ approach would be to raise taxes and cut government spending. Osborne plans to just cut spending. The increase in welfare payments is probably not what you might think it is. The report’s Table 5.7 shows it is not higher unemployment benefits or income support: by 2018/9 unemployment benefit is the same as in 2007/8, and income support is 0.5% lower as a share of GDP (which is the main reason why poverty will increase over the next five years). Housing benefit is 0.3% higher as a share of GDP (partly reflecting depressed real earnings), but the main reason is the state pension, which is almost 1% higher as a share of GDP. This represents both an increased ‘caseload’ (more pensioners) and a more generous value of pensions themselves. Although the numbers suggest that here too Osborne plans to pay for this additional spending by cutting the size of government, he has indicated that he hopes to reduce this increase in welfare payments by some, as yet undeclared, means. So this is why the reduction in the size of the state planned for 2018/9 is much more than reversing Labour’s increase: in fact, if welfare cannot be cut further, to decrease its size to “probably to the lowest share of GDP since 1938” (p128). In this particular respect, therefore, this government plans to go well beyond anything Margaret Thatcher ever attempted. I suspect when some people write that this Conservative party is more right wing than any since the war, many reading think this is hyperbole. On this metric at least, it is simply fact. Can a country be too competitive? In my earlier post on the failure of the Eurozone to understand the lessons of the Great Depression, I talked about Germany becoming ‘too competitive’. From some comments it seemed this was a contradiction in terms: how can a country ever be too competitive? I think it was obvious then that I was talking only about relative prices: being competitive in quality is something else. The problem is that Germany did become too competitive in price terms from 2000 to 2007 relative to pretty well all its Eurozone partners. The reason for this was a remarkable degree of real wage restraint in Germany. The chart below plots annual increases in real wages in Germany (either relative to the CPI or the GDP deflator) compared to labour productivity. Although these two series do not always move together, divergence between real wages measured relative to the GDP deflator and labour productivity are unusual because they imply a changing share of labour income. Whatever the reason behind this unusual wage restraint, it is bound to cause problems within a monetary union if other countries do not do the same. 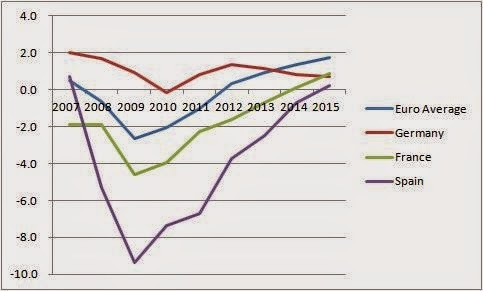 Unless Germany entered the Euro at an exchange rate that was unsustainably uncompetitive (and there are good reasons for doubting this possibility), and unless there is a structural deterioration in Germany’s non-price competitiveness that needs to be offset (which seems unlikely given its huge current account surplus), then these competitiveness gains have to be reversed. German inflation, which was below the rest of the Eurozone, will have to be above inflation in the rest of the Eurozone for some time. These are the rules of the game for a monetary union. As Germany is the outlier, this is a problem of Germany’s making. I’m normally reluctant to mix macroeconomics with morality, but those that suggest that it should be other countries that have to adjust towards Germany have things completely wrong here. Even if you believe that German real wages had to fall to reduce structural unemployment, Germany has no right to impose the same policy on other countries. A price it should pay for undercutting its neighbours is to experience a period of above ECB target inflation (e.g. 3% CPI inflation, which probably means nominal wage increases of something between 4% and 5%). If that is not going to happen, Germany should stimulate its economy to ensure it does. Anything else is the monetary union equivalent of anti-social behaviour. There are many laudable reasons to campaign for Scottish independence. But how far should those who passionately want independence be prepared to go to achieve that goal? Should they, for example, deceive the Scottish people about the basic economics involved? That seems to be what is happening right now. The more I look at the numbers, the clearer it becomes that over the next five or ten years there would more, not less, fiscal austerity under independence. The Institute for Fiscal Studies is widely respected as an independent and impartial source of expertise on everything to do with government spending, borrowing and taxation in the UK. It has produced a detailed analysis (recently updated) of the fiscal (tax and spending) outlook for an independent Scotland, compared to what would happen if Scotland stayed in the UK. It has no axe to grind on this issue, and a considerable reputation to maintain. Their analysis is unequivocal. Scotland’s fiscal position would be worse as a result of leaving the UK for two main reasons. First, demographic trends are less favourable. Second, revenues from the North Sea are expected to decline. This tells us that under current policies Scotland would be getting an increasingly good deal out of being part of the UK. To put it another way, the rest of the UK would be transferring resources to Scotland at an increasing rate, giving Scotland time to adjust to these trends and cushioning their impact. Paying back, if you like, for all the earlier years when North Sea oil production was at its peak. The SNP do not agree with this analysis. The main reason in the near term is that they have more optimistic projections for North Sea Oil. The IFS analysis uses OBR projections which have in the recent past not been biased in any one direction. So how do the Scottish government get more optimistic numbers? John McDermott examines the detail here, but perhaps I can paraphrase his findings: whenever there is room for doubt, assume whatever gives you a higher number. In my youth I did a lot of forecasting, and I learnt how to be very suspicious of a series of individual judgements all of which tended to move something important in the same direction. It is basically fiddling the analysis to get the answer you want. Either wishful thinking or deception. I personally would criticise the IFS analysis in one respect. It assumes that Scotland would have to pay the same rate of interest on its debt as the rUK. This has to be wrong. Even under the most favourable assumption of a new Scottish currency, Scotland could easily have to pay around 1% more to borrow than rUK. In their original analysis the IFS look at the implications of that (p35), and the numbers are large. So what would this mean? Could Scotland just borrow more? I am all for borrowing to cover temporary reductions in income, due to recessions for example, which is why I have been so critical of current austerity. However, as the IFS show, North Sea oil income is falling long term, so this is not a temporary problem. Now it could be that the gap will be covered in the longer term by the kind of increases in productivity and labour supply that the Scottish government assume. Governments that try to borrow today in the hope of a more optimistic future are not behaving very responsibly. However it seems unlikely that Scotland would be able to behave irresponsibly, whatever the currency regime. They would either be stopped by fiscal rules imposed by the remaining UK, or markets that did not share the SNP’s optimism about longer term growth. So this means, over the next five or ten years, either additional spending cuts (to those already planned by the UK government), or (I hope more realistically) tax increases. When I was reading this literature, I kept thinking I had seen this kind of thing before: being in denial about macroeconomic fundamentals because they interfered with a major institutional change that was driven by politics. Then I realised what it was: the formation of the Euro in 2000. Once again economists were clear and pretty united about what the key macroeconomic problem was (‘asymmetric shocks’), and just like now this was met with wishful thinking that somehow it just wouldn’t happen. It did, and the Eurozone is still living with the consequences. So maybe that also explains why I feel so strongly this time around. I have no political skin in this game: a certain affection for the concept of the union, but nothing strong enough to make me even tempted to distort my macroeconomics in its favour. If Scotland wants to make a short term economic sacrifice in the hope of longer term gains and political freedom that is their choice. But they should make that choice knowing what it is, and not be deceived into believing that these costs do not exist. No apologies for writing more about Scottish independence, which is a big deal for a Union that has been around longer than the United States. However this post also has a more general theme. So what is going on here? Perhaps voters have looked in detail at the numbers, and concluded that most economists are wrong. A little more plausibly, voters have decided the next decade or so are not critical, and in the longer term the kind of dynamism that the Scottish government’s numbers assume will come to the fore. However, a more worrying conclusion is that voters are simply not aware of what economists as a whole think. They are certainly exposed to the economic arguments, and to some economists, but invariably in the form of a two sided debate. I suspect something very similar happened with the macroeconomic debate on austerity. Once again, a survey suggests that the vast majority of economists think that fiscal stimulus increases output and employment. Yet there are of course many prominent economists who think otherwise, and the format of media discussion is generally a debate between two sides, particularly when issues become politicised. Another example may be climate change, where at least in some countries public views have become more sceptical in recent years. Maybe this is because of the weather, but maybe it is also because climate change is increasing viewed as a ‘controversial’ topic which lends itself to the two-sided debate format. Returning to Scotland, it would be very easy to test what is going on here. As well as asking people whether they think they will be better or worse off, they could be asked what they think most economists think. If, as is the case for climate change, public perception about scientific opinion is very different from reality, then this is a big problem for democracy and the media. If instead the public know what most economists think but have rejected this expertise this is a big problem for economists. It seems important to know either way. In a previous post I explained why, in a very simple setting, it was best to use lower interest rates to stimulate demand, but that both tax cuts and increases in government consumption could do this job as well, with welfare costs that were minor compared to the cost of inadequate demand. So, to use a bit of jargon, cutting interest rates is first best, but if that first best was not available because nominal rates had hit zero then fiscal policy should be used. If there was a financial constraint on the size of the stimulus, government spending was generally more effective than tax cuts. What about unconventional monetary policy? There are two main kinds: forward commitment to above target inflation (and a positive output gap) in the future, and printing money to buy various kinds of assets (QE). In each case I want to compare the welfare costs of these policies with the costs of using fiscal policy. However there is also the issue of uncertainty of impact: we need to know how much of a policy measure to apply: this uncertainty issue was not critical in the previous post because we have a lot of evidence about the impact of conventional monetary and fiscal policy. I will consider each type of unconventional monetary policy in turn. One way of stimulating demand when interest rates are stuck at zero is to promise a combination of higher than ideal inflation and higher than ideal output in the future. (This can be done either explicitly or implicitly by using some form of target in the nominal level of something like nominal GDP. For those not familiar with how this works, see here.) The cost of this policy is clear: higher than ideal future inflation and output. Once again, these costs can be worth it because of the severity of the current recession, which is why nominal rates are stuck at zero. Whether these costs are greater or less than the cost of changing government spending is debatable: a paper by Werning that I discussed here suggests optimal policy may involve both. The other unconventional monetary policy is QE: printing money to buy assets. Now it could be that this policy is doing nothing more than signal forward commitment to lower interest rates in the future, which moves us back to the previous discussion. Suppose it is more than that. I think a largely unresolved problem is how distortionary this policy is. For example, in one of the most popular models that has explored the effectiveness of QE by Mark Gertler and Peter Karadi, the central bank makes loans or buys government debt. In doing this it reduces a risk premium, which is welfare improving. This raises the obvious question of why QE is not permanent. The authors get around this problem by assuming that the central bank is less efficient than private banks in knowing which assets to buy. However I’m not sure whether anyone, including the authors, has any idea what these efficiency costs might be. Perhaps these distortions are quite small. However this discussion illustrates a more serious problem with QE, which is that we still have no clear idea of its effectiveness, or indeed whether effects are linear, and what the best markets to operate in are. Announcements about QE clearly influence the market, but that could be because it is acting as a signalling device, as Michael Woodford has argued. Jim Hamilton is also sceptical. This strongly suggests that the uncertainty associated with the impact of QE is far greater than any uncertainty associated with either conventional monetary policy or fiscal policy. Thinking about it this way, I cannot see why some people insist that unconventional monetary policy is always preferable to fiscal policy. In a comment on a recent Nick Rowe post, Scott Sumner writes “My views is that once the central bank owns the entire stock of global assets, come back to me and we can talk about fiscal stimulus.” What this effectively means is that it is better for one arm of the state (the central bank) to create huge amounts of money to buy up large quantities of assets than to let another arm of the state (the Treasury) advance consumers rather less money to spend or save as they like. This preference just seems rather strange, but maybe Lenin would have approved! If a temporary increase in government spending is in fact believed to be permanent, its effectiveness at stimulating the economy largely disappears, but this is not a problem of time inconsistency. Another difference is that governments are increasing and decreasing spending all the time, whereas it is much more unusual for an advanced economy central bank to deliberately create a boom. In case any of you thought that yesterday’s post seemed way too speculative and a bit too 'lefty' (I think it was just - admittedly rather speculative - political economy: trying to explain an empirical phenomenon involving beliefs by thinking about self interest and ideology), here is an antidote that takes another look at Scottish independence. My cue comes from the excellent George Monbiot, who I always look forward to reading. The quality of most of Monbiot’s writing is so good because it is well researched, and this sometimes leads him to conclusions that are politically uncomfortable for him. This, as you might have guessed, is a preamble to saying that occasionally he can get things very wrong. In a recent column, Monbiot describes a No vote to Scottish independence as “an astonishing act of self-harm”. What he does is list all the things that are wrong with governance in the UK. It is a long list, and I agree with quite a bit of it. Then he says, in effect, why not vote to be free of all that? This seems to me like utopianism at its worst. Why should we presume that an independent Scotland would be free of all the things we dislike about the UK? He talks about the UK economy being about “speculation and rent”, “beholden to a corrupt financial centre”, compared to a Scottish economy based on “enterprise and distribution”. Does this assume that much of the Scottish financial sector leaves on independence? If they do not, how long will it be before they use their influence (and the threat of leaving) at Holyrood? I do not want to suggest that an independent Scotland would not be different from the remaining UK in some ways. But to understand what these ways might be, you need some serious analysis of why the things you do not like in the UK happen, and why they would not happen in Scotland. I would be interested to see analysis of this kind, and I hope I would be prepared to change my view about what is in Scotland’s interests as a result. But there is an uncharacteristic lack of analysis in this article. He writes “The monetary policy committee is based in London and bows to the banks.” That really is nonsense. He is right that plenty of small countries with their own currencies thrive, and I have argued that an independent Scotland would be better off with its own currency. But that is not the policy of the Scottish government. Are they lying to attract votes, or do they want to be beholden to the interests that Monbiot derides? Either way, that does not reflect too well on Scotland’s future rulers. Or what about newspapers? The UK “is dominated by a media owned by tax exiles, who, instructing their editors from their distant chateaux, play the patriotism card at every opportunity.” I have a lot of sympathy with that view. But in Scotland the largest selling newspaper is the Scottish Sun, owned by guess who. And no Scottish political leader would play the patriotism card, would they?!. I think it is possible that some of those intending to vote Yes are reasoning in a similar way to Monbiot’s article. The question to ask is not could things be better in an independent Scotland. Of course they could. The relevant questions to ask is are there reasons to believe things will be better. That involves taking a realistic rather than romanticised view of its people and institutions, together with an honest assessment of the constraints an independent Scotland would face.